Poverty in Venezuela has led some citizens to turn to flamingos for food, authorities say. CARACAS, Venezuela (Reuters) -- Poor rural Venezuelans are using nets and hooks slung under kites to catch endangered flamingos to eat or sell their meat as they try to ward off hunger, regional authorities said. In Falcon state on the South American nation's western coast, children are hunting the long-necked birds despite attempts by the Environment Ministry to educate residents to protect them. "They tie a net to the tail of a kite and the flamingos fall. It's mostly for food," said Francis Arias, mayor of the small town of Acosta. "There are some poor people who hunt them and sell their meat to buy other things. The meat is pretty red. It's not a white meat." A fourth of Venezuelans live in extreme poverty despite the huge oil wealth generated by the world's fifth-largest crude exporter. The country is crawling out of a deep recession after two years of political conflict over the rule of President Hugo Chavez. Chavez, a populist first elected in 1998, has vowed to reduce poverty with social, education and health reforms. His opponents say he has failed to fulfill his promises and are demanding a recall referendum. - White or red...still meat. 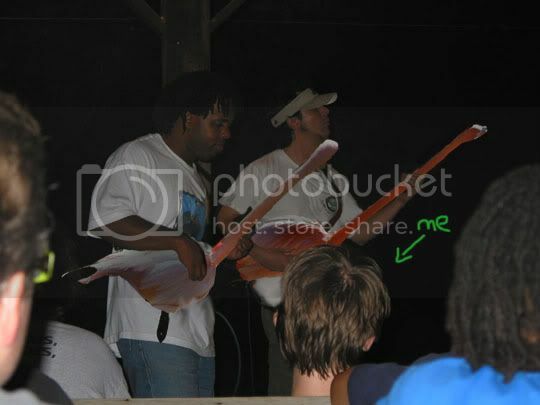 well, the back-story to that picture, on another forum I visit(an all bass forum) A beginner asked a question about 'flamingo slap' He said "this is a technique that victor wooten uses, can anyone help me out with it?" I corrected him by saying that there is no "flamingo slap" and what he was looking for was either "double thumb" or "flamenco slap" I noted that I had never heard of "flamenco slap", I know various flamenco guitar techniques that I apply to bass, but that I had never heard any of them called "flamenco slap"
So, this guy thanks me for the information, and in the meanwhile I cracked open photoshop and decided it would be really funny to make it look like victor wooten was literally slapping a flamingo. I made that picture, and posted it here too to (hopefully) lighten the mood around these parts a little. So, Just last night someone posted in that thread on the other forum, noting that bassist, adam nitti, uses a technique that he calls "flamenco slap" essentially it combines a flamenco strumming technique with a bass slap technique. And then of course, I had to goto photoshop again. so, here's the yield of my labor, it's still spotty in some places, but I was too tired to clean it up. Definately a better use for a flamingo.